You could buy a lot of carrots for £43,400. Or a luxury hutch with all-mod cons. But one individual has decided to splash that amount of cash on a first edition of The Tale of Peter Rabbit, by Beatrix Potter. The book went up for auction today at Dreweatts and Bloomsbury on the what would have been Beatrix Potter's 150th birthday. This issue was originally given by the author to her goddaughter, Helen Burton, and is one of only 250 copies from the first printing of one of the most important children’s books of the 20th century. No details have been released about the buyer. Other Beatrix Potter items also went under the hammer at the auction - including a watercolour study of Miss Moppet's mouse, which sold for £16,120. 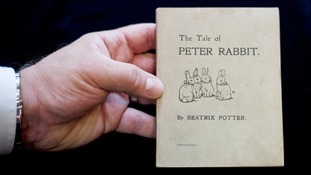 The rare 1901 edition of The Tale of Peter Rabbit will go under the hammer to mark the 150th anniversary of the author's birth.